Recently I was contacted by a researcher, named Zoe, who is working on a series for the History Channel (set to air in 2011), which will include a segment about Mormons. In her research for the series, Zoe came across The Single Mormon Girl’s Guide to Life. She became interested in some of the topics covered on the blog and contacted me to ask me questions about all things pertaining to Mormon dating…both those covered on the blog as well as things she had heard about elsewhere. We talked about the pressure to marry early, group dates, Mormon spinsters, DTR’s, Singles Wards, NCMO, etc. Zoe and I also talked about modern day prophets, food storage, missions, the Word of Wisdom, the church welfare program, family, BYU, and even about fry sauce and funeral potatoes. It was a pretty comprehensive interview. And then at the end of the interview she asked me what being a Mormon meant to me…what the essence of Mormonism is…and how Mormons feel that they are different from non-LDS people. Anyway, those questions left me thinking about what it really does mean to be Mormon. Since talking with Zoe, I’ve thought of several different ways that I might have answered her, instead of the way I did. And then I wondered how the readers of this blog would have answered those questions. So, what does being a Mormon, specifically a single Mormon, mean to you? 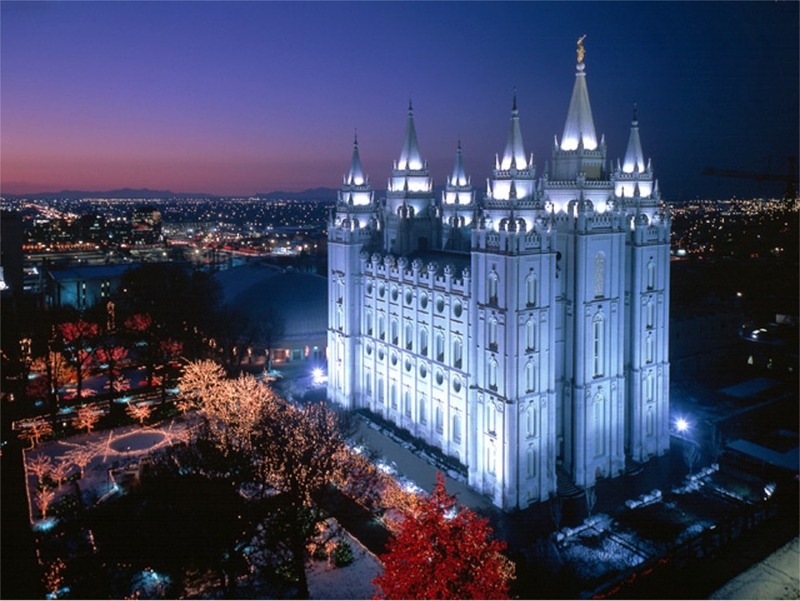 What would you say the essence of Mormonism is? How do you feel different from the rest of the world…or do you? Do share. I’m curious to know what you have to say. And, I’m curious to see if anyone would have answered the question in the same way I answered it. Also, Zoe said she’d check back on this blog to see what the readers’ responses are to these questions. So who knows, maybe your answer will influence Zoe’s research and therefore the History Channel program on Mormons…and then you’ll be famous…or will feel famous at least. Being a Mormon means everything to me. Having the gospel knowledge that we do gives me hope in every trial that I ever come across. Through the gospel and doctrine found within the Mormon church, I am reminded that I am loved, that I am a Daughter of God, and that I’m always watched out for. It gives me a sense of peace that nothing in the world could ever give me. I have no doubt in my heart that the Church of Jesus Christ of Latter-Day Saints is the true church upon this earth. I feel the truth so intensely it brings tears to my eyes no matter where I am. I feel different from the world in general in the area of standards. It’s not only the LDS church where good people stand, but having morals and standards is like, the essence of Mormonism entirely. I feel different because to be honest, I know the truth. I see the world in an eternal perspective (life after death) and it helps me live through everyday with a hopeful heart, a trusting faith, and love for our Heavenly Father and Savior, Jesus Christ. Being a single Mormon also means something to me. Once you’re married, you’re working together to become closer to God and it’s a partnership. But while I’m single (and you can still do this when you’re married, but it’s one less thing to stress about if that makes sense?) I have more time to have personal prayers with our Heavenly Father. To learn the gospel on my own, to strengthen my testimony everyday, and to improve myself towards perfection in Christ. Basically I have the amazing opportunity to become as strong as I can in this true gospel and in Christ so that when the time comes for marriage and an eternal companion and the responsibilities that come with it, I will be ready with Christ by my side. I love that this reporter contacted you and talked to a “real” mormon to see how regular people understand their beliefs. (that made a lot more sense in my head.) Anyways, I wanted to answer one of your questions. Being a single mormon… at this point I am making the most of it since my two best friends are now newly weds. The essence of mormonism… too deep to think about this morning. But what makes me feel different from the rest of the world, now thats a question I can get behind! Maybe it stems from having been on a mission; when I meet someone new, I don’t just notice their outside appearance or speech pattern or their choice in perfume. I am usually thinking “I know the whole truth. The big picture. And I wish you did too.” I feel different from the rest of the world because I feel responsible for them. If I don’t share the gospel with them in some little way, they may never know anything about it and that would be my failure. It’s a tricky and delicate question to answer, and I think it means something a little different to everyone. I don’t think there are right or wrong answers – no matter what you say, it can be interpreted differently by the receiver. To me, being Mormon is all about being happy – or more than that, having joy. We are blessed with a lot of knowledge about our purpose and the path that leads to ultimate happiness. Everyone has the freedom to choose the kind of happiness they want to pursue. To me, choosing to be Mormon, is choosing to do the things which will lead to the most joy in the long run. It is more than subscribing to a culture, or a “global tribe”. It is more than being a part of a large religious organization. To me, being Mormon is all about living my life the best way I know how – and I do know how because of the gospel. For that, I am grateful. For me there are two different aspects to being LDS; a religious aspect and a cultural aspect. The religious aspect of being LDS means that I work on and grow through my personal relationship with Jesus Christ. It means the exercise of faith, the peace of the Gospel, and the joy that comes from knowing who I am, why I am, and where I am going. It brings me comfort and security knowing that I am loved and guided by God. My faith and the principles and ordinances to which I adhere give me great strength to face the trials and hardships we all have in life. It fills my life with all the best things in life: love, comfort, peace, faith, hope, charity, and friendship. The cultural aspect of being a single LDS woman of a certain age means something different. Culturally, I am a statistical outlier. I do not fit the traditional, cultural mold. While marriage and family are things I do want and plan for, my life now is substantially different from the lives of the majority of my peers, who have husbands and growing numbers of children. This makes connecting and building friendships more difficult. Our different lives create different demands on our time, making scheduling activities sometimes impossible. Additionally it means that well-meaning and sweet people inadvertently say things that hurt. Occasionally it means standing there smiling when you want to cry because of thoughtless words. The challenge as a single LDS woman of a certain age is to make sure I don’t mistake those cultural and religious aspects for one another. Being a statistical outlier means that sometimes I will not fit in socially or culturally. However, that does not mean that the Gospel, its principles and ordinances, or its organization is untrue or flawed. It means that when I am feeling upset, angry, hurt, or lonely I have my faith to bring me peace and healing through the Atonement of Jesus Christ. I have seen too many friends and acquaintances walk away from that source of hope and comfort because of the sometimes unfortunate cultural aspects of being LDS and single. I strive everyday to ensure I don’t do the same. Being Mormon is the central question of my life. I converted a year ago, and while much of my life has changed, some has not. Sill, if it’s 75% change, there’s a lot to ponder. For me, being Mormon means having definite knowledge and firm doctrine to fill in the grey areas that I didn’t like before. Having certainties about big questions like purpose in life, what happens after, and why I live to certain standards gives me the chance to live from peace, not fear. Being Mormon means being part of a world-wide family in which most are sincere in their desire to do any kind of service for one another and others. Being a long-term divorcee, this is something I need from either end. I need help increasingly often, but I need to give as well. Many in my family don’t like accepting help. Being Mormon means living the Word of Wisdom, the Law of Modesty, the Law of Chastity and all of the other commandments. For me, changing my ways at 44 has meant arriving at a lifestyle that I needed for decades but couldn’t put together on my own. I’m intelligent, highly educated, and generally sharp, but I did not figure out how to protect myself emotionally and physically until I learned the commandments and began to live them. I have learned, because I’m ready, that God’s Law is for me. Being Mormon means being a minority within a minority. I’m an outspoken political Liberal from NY with international sensibilities and a strong background in good food, great art, and following artistic impulses. Arch-Conservative hunters aren’t my peer group, so dating is pretty non-existent. I sense a bit of ageism in the dating pool at times, too. The day-to-day culture of being myself and being Mormon can be dissonant, but the challenge to civility and to remain myself are both educational and daunting. I’m not sure where you live, but there are lots of liberal mormons here in Albuquerque, NM. I am a conservative and have trouble finding someone with similar sensibilities. I am new to your site and am different than maybe most of your readers as I’m a divorcee. I recently went through about a 15 month period of intense challenges. Someone close to me recently made a comment that she believed it was my faith that gave me the ability to handle those challenges with grace, serenity and actual happiness. I just found your Blog Miss Jones and I’m enjoying it. I’ll read it from the Beginning on… It gives me hope… Thank you! Being a 25 year old Mormon, single, liberal AND Vegetarian Girl is hard. But to answer your Question, my faith to the church teachings is deep. I believe in God. I read in the scriptures and the Liahona. I believe in the Gospel and eventhought we are different from the world, it does not make us automatically “better”. But being “not” married is somehow a burden. Maybe almost to a point in which is ridiculously annoying. Why? Because I wanna go Sundays to church without being always asked if i have a boyfriend, if i do not want a family, if I knew if that “girl” from some other ward is getting married, if i knew this nice man who is visiting church OR while translating to a young man nobody knew, many members came to ask the name of my boyfriend, calmly i explained that he wasn’t and that he is on vacation here (Guess what, they asked my family about “my boyfriend”). Seriously, to love your next and forgive them only so they do it again each Sunday is at it’s limit. Telling Members to mind their own business is rude and it’s almost considered treason. What I sometimes can’t understand is like this person i know ( she married with 31…) who is also into that “game”. It feels like if there was an unwritten rule to marry as soon you turn 21 in my ward… And please consider that I do not live in Utah, or the United States. I’m living in Europe, most liberal place on the earth. I’ve never dated someone from Church, as much as i would have loved it (my first mormon crush turned out to be gay…). And dating outside the church is cruel… because you know from the start that it won’t work for too long. Because Men want to be intimate in a relationship. At the beginning it’s ok. and I believe they like the thought that they “will”/”could” be the first and as soon you tell them that you gonna wait ’till marriage, well that’s when they start to lose some patience and see some true faces. To be honest, I stopped going to church, it’s useless to go and turn back home mad and sad. And it’s not what I should feel after Sunday morning. I’m still doing things like visiting Sisters once a month with a nice and understanding Sister. I rather be labeled a black sheep or rebell than having to be fake. But of course this is temporary, I can’t do it all my life. So I’m considering to start new in another ward. I just wanted to escape that whole situation, the pressure and the disapointment. I’ve been in church my whole life, and growing up i was in every school the only mormon, except during my year in the USA. In someway we all are “alone” here and have to do many things alone. Church is not always church but the Gospel is true and it has helped me and guided me in so many ways… How can I throw something so beautiful and unique away? I just learned that there are humans good and bad… And there is Heavenly Divine. I’m from New York. I don’t care whether others consider being told to back off is rude to THEM; their intrusive behavior is considered rude by most of civilization. I wouldn’t let anything keep me from the Gospel – the only power that can do that is Heavenly Father. Being a new adult convert and a Progressive beyond Liberalism is not easy in Indiana. Plenty of people have said and done inflammatory, controlling and offensive things to me. I simply say “I don’t discuss that with others” or “I am more than a divorcee. I am a Daughter of God. While I appreciate your concern, you could just find me a husband. Know anybody?” Or “I don’t do Midsingles.” People always back off when asked to play matchmaker, and a definitive NO, even if it has to be repeated, is usually honored. Ultimately, it’s rude for anyone to imply that you are your marital status and that being a Daughter of God is insufficient for others. Folks need to be reminded of that. It’s made life uncomfortable at times, but I remain active. Rude people should not get their way just because they’re in the majority. My two cents. I understand and appreciate your post. Thank you! The thing is even if I “dare” speak my mind, to me I honestly don’t care what people think about me, but the thing affects the whole family. Anyway, like I said not going to church is the easiest way out there, and I’m not proud… but this break for me that was the only way to do it for now. If you are still single, please go to celibateinthecity.blogspot.com. Check out! Letter to LDS Single. I’d love to hear your opinions on this. Thanks. I just came across this blog…hoping it’s not too late to post as some comments were made quite awhile back. Also, hoping you don’t mind I post on here to say thanks for having these comments/questions about being a single LDS woman. Being a Christian with strict rules (LDS) brings joy & a lot of explaining to others who don’t share my same faith! @Nefertari, I loved your post & can relate a bit. I’m also vegetarian, 31, & live in liberal europe. I’ve had an ex-boyfriend tell me he was gay after we dated (makes me feel a little weird that I attracted a gay man). The point is, I lived in NYC for 6 years, worked as a fashion designer, & met a ‘non-member’ & we married when I was 30. I married because I love him, but I certainly know how it is to be a single Christian woman. Being LDS comes with some strange cultural nuances that I have never understood or will adapt to, however the gospel is centered around Jesus Christ & am thankful I have the knowledge I have gained through years of questioning, studying & receiving knowledge. My heart goes out to all of those who are single LDS women. Wanting to share your life with a partner that loves & accepts you for who you are & shares similar goals is ideal & not everyone will have that when they want it. It makes me incredibly sad to say that, but I have friends who are amazing & are still single at 34 & would like to marry LDS. I hope & pray that you will not be judged & questioned, but be accepted for who you are & the lives that you live. Lot’s of love, blessings and all the best for your future! Hi, oldmaidmormon here. Just want to give a shout-out to anyone who comes across this blog and notices that Miss Jones hasn’t posted anything new for almost a year now. Perhaps she was eaten by wild dogs but it’s my hope Prince Charming came along and swept her off her feet.